After entering weekly sales and wholesale order information for consultants manually or importing into Boulevard, you can organize and summarize the information in a variety of ways, depending on your needs. Choose from either displaying the information on screen, copy to the Windows clipboard, or email*. 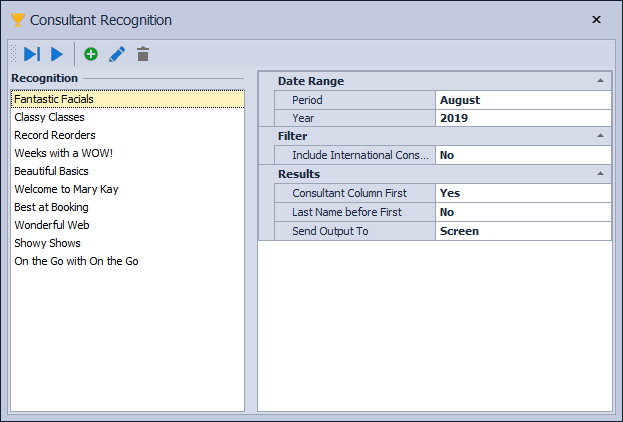 To access Consultant Recognition, from the Shortcuts form, click Consultant Recognition (or from the Unit menu, select Consultant Recognition). From the Consultant Recognition tool bar, click . From the Top Consultants Query form, enter a query description in the Title field. From the Query drop-down list, select the desired query. Under the Top Consultant and Which Consultant sections choose the applicable criteria, then click OK to save and close the form. On the right-hand side of the Consultant Recognition form, set the desired criteria from the Date Range, Filter and Results section. To run one query, select the desired query under the Recognition section then click from the tool bar. To run all queries listed under the Recognition . Select the desired query under the Recognition section then click from the tool bar. Make any necessary changes, then click OK to save and close the form. Click Yes to confirm and close the form. * If email is chosen, the either a desktop email client or email settings entered under Preferences first.